It has been some considerable time since we had any stock of the Black /Chrome Coolers come in. The stock built over the summer months went mid September – time spent searching the used market for units is getting to the stage where it is becoming uneconomic if its cost was allocated to the cost of each unit sold. Every now and then there is a scent of ‘box of 10 unused stock’ awaiting purchase – Having found just such a scent I am awaiting confirmation that they are ‘real’ product to buy and not some virtual record legacy of last years stock adjustments in a warehouse….. But still 10 new unused units – could be a good find ! Meanwhile, back in the workshop, having made up all product available it is time to review what next – until the next batch is required. There remains lots of components to produce ‘eggs in baskets’ all well and good but not really what I fancy doing just now. I have a small commission for a ‘steak knife’ made from a Damascus steel blank I found on line. 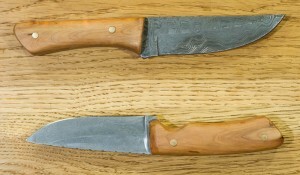 Olive wood handle cheeks secured with brass rivets – should be a fine looking knife. 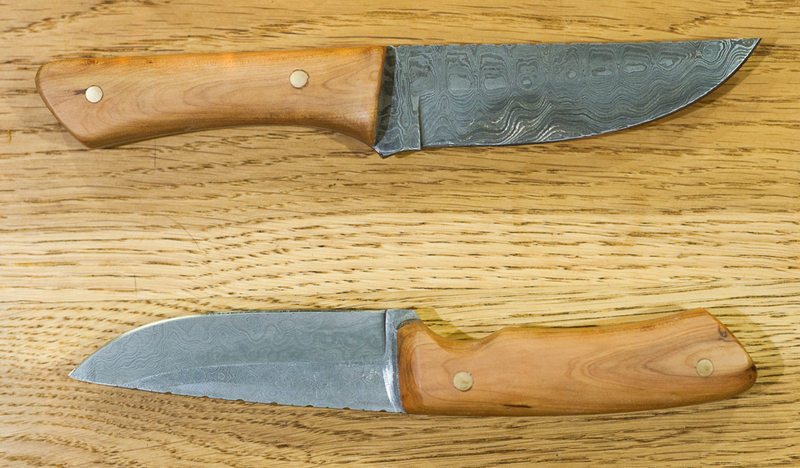 My pair of similar knives with Juniper Wood handles are very pleasant to use if a little robust for fine dining – but that’s not me. I love to eat good food – not a great fan of fuss and trimmings – but good wholesome simple cooking. If I can’t make it ready to eat within 20 minutes -its too much trouble – which does kind of limit things in the preparation department if like me you are not so quick around the kitchen. Steaks – bit of the ‘green stuff’ alongside well that works. Each is approx 8″ long in total – The blades hold a good keen edge – honed to a mirror finish – which lets me slice an over ripe tomatoe for my cheese butty and cuts through my ‘economy’ steaks as if it was prime top notch sirloin. If you are reading this then you have already found our new fancy looking website. The design, code work and …. well everything is down to a young graduate from Sheffield Hallam University – ‘Byron’ working for Reflow Studio in Hathersage – smashing bunch of chaps – I only wished a understood half of what they tell me when we talk about the architecture of the sites. Some day code work may well be generated automatically from icon driven interfaces – between then and now I should think the likes of Byron have a prosperous future ahead of them interfacing as they do between the ‘have no idea how but can you just make it do this..’ and the internet ! Take a look at the website – there is lots of great opportunities to see what you can do with a little motivation and some funds to work with in order to reduce your carbon foot print. That’s all folks – back to the workshop for me.